Click here for audio of Episode 1392. Today, fog in the forest. The University of Houston's College of Engineering presents this series about the machines that make our civilization run, and the people whose ingenuity created them. Legend has it that a London headline once cried, Thick fog over the Channel: Continent Isolated. So: did you ever wonder why fog doesn't just fall to the ground? 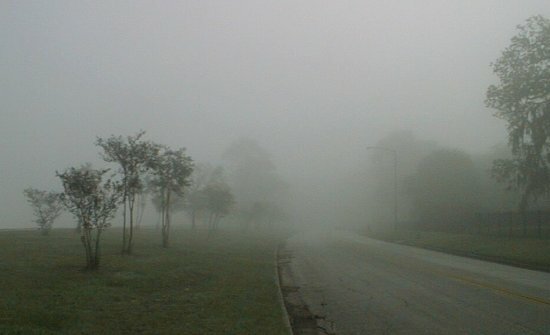 Fog is made of small water droplets, far more dense than air. What holds it up? The diameter of those drops is under a thousandth of a millimeter, and a dense fog can hold as many as 10,000 droplets per cubic centimeter. Since fog droplets are so small, the force of air molecules bumping into them swamps out the force of gravity. If you look through a microscope at tiny particles in a fluid, they dance about the way molecules do -- up, down, left, right -- under the impact of other molecules. Two New York Times articles talked about fog. One was the obituary of Meredith Gourdine, president of Energy Innovations here in Houston. Gourdine was already on his way to becoming one of America's great black engineers when he won a silver medal in the 1952 Olympics long jump. After that, he earned a Ph.D. in engineering at Cal Tech. During his long and productive life, Gourdine received seventy patents. Most of them had to do with fog. Gourdine invented means for dispersing fog and smoke. By applying strong electrical forces to those tiny droplets he created means for making them go where he wanted them to. Nature has her own means for laying hold of fog, and that's what the second article was about. The great Redwood trees need a lot of water. Think about the pump that'd be needed if water had to go from the ground up to branches over 300 feet in the air. Redwoods need no such pump, because they drink fog. They're designed to take in water from the top down. Redwoods have dense upper branches and needles. Fog condenses on the needles and drips downward. What the tree doesn't soak up, it rains down upon the ground below. The redwood's fairly shallow root system extends far outward from the trunk to receive all the water caught by the tree. The tree also waters the ecosystem in its shadow. Cut down a redwood forest and you rob every other plant of its water supply. That eliminates the plant sustenance needed to replenish the trees themselves. By now we've cut down 96 percent of all virgin redwood stands. Unlike smaller trees, they don't grow back in twenty to fifty years. And, since a single redwood tree can be worth a hundred thousand dollars to a logger, the economic motivation for cutting it down is immense. Litsky, F., Meredith Gourdine, 69, Athlete and Physicist. New York Times Obituaries, Tuesday, November 2, 1998, p. A29. After this episode aired, listener Dennis Dria wrote to question my "largest living thing" remark about the great redwood tree. he pointed out that an extremely large fungus in Michigan covers an area exceeding 30 acres. His estimate is that it is larger by volume than the redwood by a factor of five.